In 1997, I was fourteen years old, a freshman in high school, and Trent Lane from MTV’s Daria was my dream man. I always seemed to catch the show when it was foggy outside and my little sister was napping on the couch. One of my cousin’s told me I sounded dead on like Daria when I answered the telephone, and I was always trying to understand why. 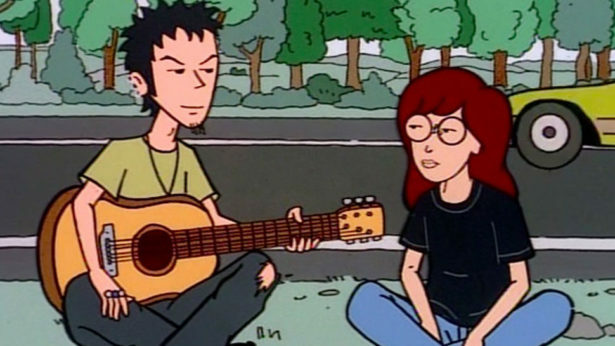 Now I realize that Daria was outspoken and that what made her the goddess that she was, but when I was 14, all I could see was the shy girl who’s cheeks blushed into tiny roses every time Trent Lane came around. Trent, with jet-black hair, Trent with the look of a Byronic hero, like Don Juan or maybe Bronte’s Heathcliff. He could have been a creature of another time, a stoic standing on a hillside with twisted trees, his cape flapping in the dark like gargoyle wings. The thing that got to me about Trent was that he was good for a girl. He was a conundrum of love to me. He treated Daria well. He treated his sister, Jane, well. Trent had a messy room and didn’t judge his mother for not being June Cleaver domestic. Trent was the son of a potter. Trent with the raised eyebrow that let you know there was more to him than a guy who slept in past 2 PM. Trent wouldn’t have shamed me for my bell-bottomed jeans ripped at the bottom and speckled with mud because I was only five feet two. Maybe Trent was the impetus of my fascination with brooding men who have goatees. He was the antithesis of desire without logic. He was a dark prince. He was good and he was interesting and he had real tangible dreams like Mystic Spiral. After meeting up for a Daria marathon last year, a few of my girlfriends and I began to fight over Trent. I argued I had dibs on Trent because his only steady girlfriend on the show was a woman named Monique, and I am a woman named Monique. Were we really fighting over a cartoon man? The answer is yes, yes we were.